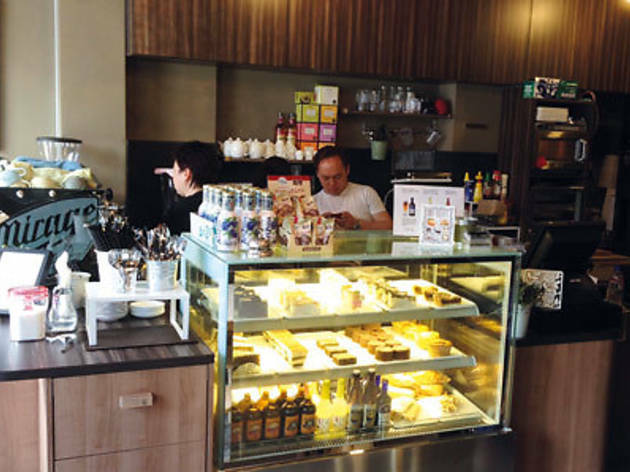 The vibe: Yet another new opening along the shophouses of Keong Saik Street, this tiny one-table café (with six seats at the table and stools lining the room) is attached to the Park 22 Hotel and named after the German word for ‘happiness’. The glass-fronted space looks stylish and bright, but given the size, there’s not much room to lounge around. The food: There’s a small menu of food options, from paninis ($8.90-$9.50) to savoury pies ($6.50, beef or chicken) and baked pastas ($8.50, beef, chicken or veggie lasagne), suitable for a snack if you’re peckish (but not recommended for a proper meal). There’s an impressive range of sweets, from cakes (outsourced to a third party bakery who uses their exclusive recipes) in various cheesecake flavours, an apple crumble, black forest and carrot cake ($6.20/slice) to Beligum waffles ($5.50) and crepes ($5.90). Don’t be tempted by either of their somewhat overpriced Combis – in the case of the Chocolate Volcano ($13.90), it’s just their lava cake served with a scoop of vanilla on the side, plus two pieces of a Kit Kat bar. The drinks: Glück offers their own ‘Supremo’ coffee blend, with beans from Costa Rica which are roasted for them by Highlander Coffee and breweed on a fancy Mirage machine. 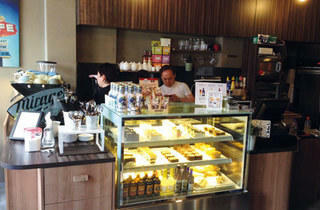 Prices start at $3.90 for a double espresso to $7.20 for an iced flavoured latte. At $7.50, their in-house specialty drinks are exorbitant: the Grey Latte is basically brewed Gryphon tea and steamed milk, while the Choco Tea, perhaps a bit more unique, mixing Gryphon Earl Grey with hot chocolate (add a dollar to make it iced for a whopping total of $8.50). Likewise, skip their smoothies ($6.90) and Glück Zesty drinks ($5), which are made with flavoured yoghurts, syrups and canned drinks, rather than fresh fruits.